Law at the London premiere of Dom Hemingway, November 2013. He began acting with the National Youth Music Theatre in 1987, and had his first television role in 1989. After starring in films directed by Andrew Niccol, Clint Eastwood and David Cronenberg, he was nominated for the Academy Award for Best Supporting Actor in 1999 for his performance in Anthony Minghella's The Talented Mr. Ripley. In 2000, he won a Best Supporting Actor BAFTA Award for his work in the film. In 2003, he was nominated for the Academy Award for Best Actor for his performance in another Minghella film, Cold Mountain. He is also known for his role as Dr. John Watson in the 2009 film Sherlock Holmes and its 2011 sequel, Sherlock Holmes: A Game of Shadows. In 2006, he was ranked as one of the top ten most bankable film stars in Hollywood. In 2007, he received an Honorary César and was named a Chevalier of the Ordre des Arts et des Lettres by the French government. He was a member of the main competition jury at the 2011 Cannes Film Festival. Law was born in Lewisham, South London, the second child of comprehensive school teachers Margaret Anne (née Heyworth) and Peter Robert Law; his father later became, according to Law, "the youngest headmaster in London". He has a sister, Natasha. Law was named after a "bit of both" the book Jude the Obscure and the Beatles song "Hey Jude". He grew up in Blackheath, an area in the Borough of Greenwich, and was educated at John Ball Primary School in Blackheath and Kidbrooke School, before attending Alleyn's School. In 1987, Law began acting with the National Youth Music Theatre. He played various roles in the Edinburgh Fringe-awarded play The Ragged Child. One of his first major stage roles was Foxtrot Darling in Philip Ridley's The Fastest Clock in the Universe. Law went on to appear as Michael in the West End production of Jean Cocteau's tragicomedy Les Parents terribles, directed by Sean Mathias. For this play, he was nominated for a Laurence Olivier Award for Outstanding Newcomer, and he received the Ian Charleson Award for Outstanding Newcomer. Following a title change to Indiscretions, the play was reworked and transferred to Broadway in 1995, where Law acted opposite Kathleen Turner, Roger Rees and Cynthia Nixon. This role earned him a Tony Award nomination and the Theatre World Award. In 1989, Law got his first television role, in a film based on the Beatrix Potter children's book, The Tailor of Gloucester. After minor roles in British television, including a two-year stint in the Granada TV soap opera Families, the leading role in the BFI /Channel 4 short The Crane, Law had his breakthrough with the British crime drama Shopping, which also featured his future wife, Sadie Frost, and a minor role in the episode "Shoscombe Old Place" in Granada's television series Sherlock Holmes. In 1997, he became more widely known with his role in the Oscar Wilde bio-pic Wilde. Law won the "Most Promising Newcomer" award from the Evening Standard British Film Awards for his role as Lord Alfred "Bosie" Douglas, the glamorous young lover of Stephen Fry's Wilde. In Andrew Niccol's science fiction film Gattaca, Law played the role of a disabled former swimming star living in a eugenics-obsessed dystopia. In Clint Eastwood's Midnight in the Garden of Good and Evil, he played the role of the ill-fated hustler murdered by an art dealer, played by Kevin Spacey. In 2001, Law starred as Russian sniper Vasily Zaytsev in the film Enemy at the Gates, and learned ballet dancing for the film A.I. Artificial Intelligence (2001). In 2002, he played a mob hitman in Sam Mendes's 1930s period drama Road to Perdition. He was nominated for the Academy Award for Best Supporting Actor for his performance in The Talented Mr. Ripley in 1999, and then again for the Academy Award for Best Actor for Cold Mountain in 2003. Both films were directed by Anthony Minghella. Law, an admirer of Sir Laurence Olivier, suggested the actor's image be included in the 2004 film Sky Captain and the World of Tomorrow. Using computer graphics, footage of the young Olivier was merged into the film, playing Dr. Totenkopf, a mysterious scientific genius and supervillain. Also in 2004, Law portrayed the title character in Alfie, the remake of Bill Naughton's 1966 film, playing the role originated by Michael Caine; and later took on another of Caine's earlier roles in the 2007 film Sleuth, adapted by Nobel Laureate in Literature Harold Pinter, while Caine played the role originated by Olivier. In 2006, he portrayed the role of Kate Winslet's single-parent brother in the film The Holiday, a modern day American romantic comedy written, produced and directed by Nancy Meyers. After his appearances in a string of period dramas and science fiction films in the early to mid-2000s, Law said he found it tricky to approach the contemporary role in this film. Like Winslet, the actor stated, he felt more vulnerable about playing a character who fitted his own look and did not require an accent, a costume or a relocation. Law was one of the Top Ten 2006 A-list of the most bankable film stars in Hollywood, according to the Ulmer Scale. On 1 March 2007, he was honoured with the Ordre des Arts et des Lettres conferred by the French government, in recognition of his contribution to World Cinema Arts. He was named a Chevalier des Arts et des Lettres. Law is one of three actors who took over the role of actor Heath Ledger in Terry Gilliam's film The Imaginarium of Doctor Parnassus. Along with Law, actors Johnny Depp and Colin Farrell portray "three separate dimensions in the film." He appeared opposite Forest Whitaker in the dark science fiction comedy Repo Men and as Dr. Watson in Guy Ritchie's adaption of Sherlock Holmes, alongside Robert Downey, Jr. and Rachel McAdams, as well as the 2011 sequel, Sherlock Holmes: A Game of Shadows. Law starred as a celebrity supermodel in the film Rage, and blogger and "prophet" Alan Krumwiede in the 2011 medical thriller Contagion. In May 2009, Law returned to the London stage to portray the title role in Shakespeare's Hamlet at the Donmar Warehouse West End season at Wyndham's Theatre. The BBC reported "a fine and solid performance" but included other reviews of Law's interpretation that were mixed. There was a further run of the production at Elsinore Castle in Denmark from 25–30 August 2009. In September 2009 the production transferred to the Broadhurst Theatre in New York. Again, the critics failed to agree on the merit of Law's interpretation: London's Daily Mail found only positive reviews, but The Washington Post felt that the much-anticipated performance was "highly disappointing". Nonetheless, he was nominated for the 2010 Tony Award for Best Performance by a Leading Actor in a Play. In January 2010 at the Critics' Circle Theatre Awards ceremony he was presented with the John and Wendy Trewin Award for Best Shakespearean Performance for his 2009 Hamlet. Law is the face of the male perfume of Dior, Dior Homme Sport. Since 2005, he has represented Dunhill as an "apparel ambassador" in Asia. In 2008, he became the international face of Dunhill and appears in the worldwide advertising campaigns. In 2002, he directed a Respect for Animals anti-fur cinema commercial. The commercial, titled "Fur and Against", used music composed by Danny Goffey, Rhys Ifans, Sadie Frost, Helena Christensen, Sir Paul McCartney, Mel C and Stella McCartney. In early 2007 Law shot the Jason Martin-directed short film "Realtime Movie Trailer" at Borough Market, South London. Instead of promoting a film, this "trailer", which appeared among regular trailers in selected cinemas across London starting 19 November 2007, advertised a live event, Realtime Movie, by Polish artist Paweł Althamer. Hundreds turned up for this–unfilmed–re-enactment in real time of the sequence of events shown in "Realtime Movie Trailer" by the same actors, including Althamer as a Polish labourer, held at Borough Market on 30 November 2007. The performance was commissioned by Tate Modern as part of its "The World as a Stage" exhibition which explored the boundaries between arts and reality. In 2004, Law launched a campaign to raise £2.5 million towards the Young Vic Theatre's £12.5 million redevelopment project. He is currently Chairman of the Young Vic committee and has said that he is proud to help make the Young Vic "a nurturing bed" for young directors. In 2006, he joined Robbie Williams in the "Soccer Aid" celebrity football match to benefit UNICEF. In 2006, he starred in an anthology of Samuel Beckett readings and performances directed by director Anthony Minghella. With the Beckett Gala Evening at the Reading Town Hall, more than £22,000 was donated for the Macmillan Cancer Support. Also in 2006, Frost and Law directed a Shakespeare play in a South African orphanage. He travelled to Durban with Frost and their children in order to help children who have lost their parents to AIDS. In July 2007, as patron of the charity, he helped kick off the month-long tour of the AIDS-themed musical Thula Sizwe by the Young Zulu Warriors. Also in 2007, he encouraged the Friends of the Earth/the Big Ask campaign, asking British Government to take action against climate change. Law does charity work for organisations such as Make Poverty History, the Rhys Daniels Trust, and the WAVE Trauma Centre. He supports the Make-A-Wish Foundation and the Pride of Britain Awards. He is the chairman of the Music For Tomorrow Foundation to help rebuild Katrina-devastated New Orleans. Jude Law serves as an ambassador of the Prince of Wales' Children and the Arts Foundation. He supports Breast Cancer Care, and in December 2008 he supported the Willow Foundation with a small canvas for their campaign Stars on Canvas. In April 2009 he supported the charity Education Africa with the gift of a mask he had painted and signed himself. The campaign was launched on eBay by Education Africa. Stars including Dame Judi Dench and Jude Law have helped save St Stephen's Church in Hampstead. The celebrities supported the campaign, which raised £4.5 million to refurbish the Victorian church in North London. The building reopened in March 2009 as an arts and community centre. In July 2007, Jude Law and Jeremy Gilley were in Afghanistan over a period of 10 days to document peace commitments and activities there for an upcoming film and for marking the UN International Day of Peace. Accompanied by UNICEF Representative Catherine Mbengue, they travelled and filmed in dangerous areas of eastern Afghanistan with a film crew, interviewing children, government ministers, community leaders and UN officials. They also filmed at schools and visited various UNICEF-supported programmes inside and outside the capital Kabul. The efforts of Peace One Day are coordinated in celebration of the annual International Day of Peace, on 21 September. The film, named The Day After Peace, premiered at the Cannes Film Festival. On 21 September 2008, the film was shown at a gala screening at the Royal Albert Hall. On 30 August 2008, Law and Gilley returned to Afghanistan to help keep a momentum around Peace Day. They met WHO for the peaceful immunisation of 1.4 million children against polio in insecure areas. In 2011 Law joined street protests against Alexander Lukashenko and his brutal crackdown on the Belarusian democracy movement. Law's parents live in Vaudelnay, France, where they run their own drama school and theatre. His sister Natasha is an illustrator and artist, living in London. Law met actress Sadie Frost while working on the film Shopping. They married on 2 September 1997 and divorced on 29 October 2003. He has three children with Frost: son Rafferty (born 1996), daughter Iris (born 2000), and son Rudy (born 2002). While making the film Alfie in late 2003, Law and co-star Sienna Miller began a relationship, becoming engaged on Christmas Day 2004. On 8 July 2005, Law issued a public apology to Miller for having an affair with the nanny of his children. It was also reported at the time that Miller had been having an affair with Daniel Craig. Miller and Law separated in November 2006. On 29 July 2009, it was announced that Law would become a father for the fourth time following a brief relationship with American model Samantha Burke in 2008. Burke gave birth to a daughter, Sophia, in September 2009 in New York. In December 2009, it was reported that Law and Miller had rekindled their relationship after starring in separate shows on Broadway in late 2009. They spent Christmas 2009 in Barbados, along with three of Law's children. They announced they had split again in February 2011. In October 2014, Law announced that he is expecting a fifth child in spring 2015. The mother is Catherine Harding, with whom Law is "no longer in a relationship". 1991 Case-Book of Sherlock Holmes, TheThe Case-Book of Sherlock Holmes Joe Barnes Television series; Episode: "Shoscombe Old Place"
1999 Tube Tales (director) "A Bird in the Hand"
^ a b "Tom Cruise and Hanks Top New Power List", World Entertainment News Network, 10 April 2006. ^ a b "French Honour for Jude Law", Reuters (UK), 2 March 2007. Retrieved 20 November 2007. 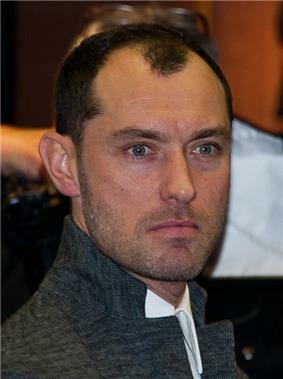 ^ France honours Jude Law French Embassy in the United Kingdom, London. Retrieved 17 May 2009. ^ "The Jury of the 64th Festival de Cannes". Cannes. 20 April 2011. Retrieved 20 April 2011. ^ a b c d e f g h i Inside the Actors Studio Jude Law, Season 10, Episode 1008. Bravo. Original Airdate: 21 December 2003. Retrieved 25 May 2008. ^ "Like Mother, Like Daughter." Marie Claire. page 16, February 2008 issue. ^ "Alumni". National Youth Music Theatre. Retrieved 21 November 2007. ^ Vincent Canby. "Theater Review: Indiscretions: Cocteau's Ferocious View Of the Rolls-Royce of Families". The New York Times. 28 April 1995. Retrieved 19 November 2007. ^ Indiscretions at the Internet Broadway Database Retrieved 1 March 2008. ^ "1995 Tony Awards." NYC Broadway Theater Guide. ^ "Theatre World Award". Theatre World Awards. Retrieved 19 November 2007. ^ "Jude Law, Most Promising Newcomer". Evening Standard British Film Awards. 1998. ^ "Full list of Bafta winners", BBC News, 9 April 2000. ^ "Law Is Natural Ballet Star". contactmusic.com, 26 August 2005. Retrieved 20 November 2007. ^ "Olivier Resurrected for Film Role". BBC News. 26 July 2004. Retrieved 12 December 2007. ^ M. Faust. "Branagh & Caine ". artvoice.com. Retrieved 13 December 2007. ^ Martyn Palmer. "Double Act: Michael Caine and Jude Law (Lunch and Discussion)". The Times. 17 November 2007. ^ "The Holiday". Hollywood One-One. ^ Bonnie Malkin. "Heath Ledger 'replaced' by Hollywood stars". The Daily Telegraph. 26 February 2008. Retrieved 12 March 2008. ^ Marsha Lederman. "They did it for Heath". The Globe And Mail. 19 April 2008. Retrieved 20 April 2008. ^ "Beauty." sallypotter.com. 30 January 2009. Retrieved 25 February 2009. ^ Briggs, Caroline (4 June 2009). "Review: Jude Law in Hamlet". BBC Arts and Entertainment. Retrieved 16 October 2009. ^ "Jude Law to play Hamlet at 'home' Kronborg Castle." The Daily Mirror. 10 July 2009. Retrieved 14 July 2009. ^ Electrifying' Jude Law wows critics as he takes Hamlet to Broadway"'". Daily Mail. 8 October 2009. ^ Mark, Peter (8 October 2009). "Jude Law in 'Hamlet': What a Piece of Work". The Washington Post. ^ "Who's nominated?". American Theatre Wing's Tony Awards. Retrieved 5 May 2010. ^ Shenton, Mark (26 January 2010). "Spring, Enron, Weisz, Rylance, Law Are Winners of Britain's Critics' Circle Theatre Awards". ^ "Dior Homme Sport". Dior.com. Retrieved 4 October 2008. ^ "Christian Dior Perfumes.". Retrieved 30 September 2009. ^ Jiang Jingjing. "Touch of Class". China Daily. (English version), 6 March 2006. Retrieved 18 January 2008. ^ "SPRING SUMMER 2009". Dunhill. (English site). Retrieved 5 April 2009. ^ "New Nationwide Anti-Fur Commercial", Respect for Animals, press release, 19 February 2002. "Fur and Against" on YouTube, added 6 December 2006. Retrieved 7 January 2009. ^ "Jude Law stars in a film that doesn't exist". TateShots. Issue 10. "Realtime Movie". transcript and video. Retrieved 27 January 2008. ^ "Realtime Movie Trailer". video uploaded on YouTube by "tateshots" on 31 October 2007. Retrieved 19 November 2007. ^ Dan Fox. "The World as a Stage". Frieze magazine. Issue 112, January–February 2008. Retrieved 12 September 2008. ^ Ben Hoyle. "The exquisite art of mobbing Jude Law". The Times. 1 December 2007. Retrieved 2 December 2007. ^ Ruth Gillespie. "Young Vic Project Backed by Jude Law". The Stage. 10 February 2004. ^ "Law's Bid to Rebuild Young Vic". BBC News. 10 February 2004. ^ Steve Purcell. "Robbie Lines Up Maradona For Soccer Aid Match". looktothestars.org, 24 May 2006. ^ "Beckett event money handed over". BBC News. 20 June 2006. ^ The Young Zulu Warriors. Official website. Retrieved 1 August 2008. ^ "Jude Law's video message". the Big Ask campaign. 4 July 2007. Retrieved 26 January 2008. ^ "The Big Ask Film". The Big Ask campaign. Retrieved 26 January 2008. ^ "Radiohead's Thom Yorke to guest-edit Observer Magazine." 20 March 2008. ^ Cf. Rhys Daniels Trust and the WAVE Trauma Centre. Look to the Stars. looktothestars.org. ^ "Jude Law – Foundation Supporter". worldwish.org. (official site), featuring hyperlinked "Princess Erin meets her Prince at the Summer Ball". Make-A-Wish Foundation. ^ "Make-A-Wish Valentine’s Ball brings love to London". Make-A-Wish Foundation. worldwish.org (official site). Retrieved 1 April 2009. ^ "Fundraiser of The Year, Kirsteen Lupton", Pride of Britain Award Winners 2006, Official site. ^ "Celebrity Quotes", Pride of Britain Award Winners 2006, Official site. ^ Jude Law, "A Message from Our Chair", Music for Tomorrow. Retrieved 10 September 2009. Cf. "Jude Law's Charity Work". Look to the Stars. looktothestars.org. with hyperlinked featured Video. ^ Nell Nolan. "Annual events call for perennial parties". The Times Picayune. 7 May 2007. ^ "TRH host a gala evening ...". HRH The Prince of Wales, Official website. Retrieved 1 August 2008. ^ "Celebrity Auction Pinkridges". Selfridges. Retrieved 5 April 2009. ^ "Jude Law". Willow Foundation. Retrieved 5 April 2009. ^ "MAKE A FACE CAMPAIGN". Education Africa. Retrieved 5 April 2009. ^ "Dame Judi Dench and Jude Law help save Victorian church". Telegraph. Retrieved 5 April 2009. ^ "About St. Stephen's". Antic Disposition. Retrieved 5 April 2009. ^ Charlie Rose. "A Conversation with Actor Jude Law". The Charlie Rose Show, WNET (New York), broadcast 19–20 October 2007, streaming video posted 22 October 2007. Retrieved 3 March 2008. ^ Roshan Khadivi. "International Day of Peace ..." UNICEF. Official home page, 20 September 2007. Retrieved 21 November 2007. ^ "Peace One Day". Official home page. Retrieved 19 November 2007. ^ "American Actor Jude Law Promotes Peace Day During Afghan Travels". Embassy of Afghanistan, Washington, D.C., Official home page. Retrieved 7 September 2008. ^ "Peace One Day Ambassador Jude Law's 'secret' Mission to Afghanistan". UNICEF, Official home page, 18 July 2007. Retrieved 21 November 2007. ^ Fiona Cummins. "Jude's Afghan Mission". The Daily Mirror. 12 September 2007. ^ "Afghanistan: Press briefing, 11 September 2007". United Nations Assistance Mission in Afghanistan (UNAMA). 11 September 2007. ^ Cf. "Peace One Day Concert", Royal Albert Hall. home.i-concerts.com. 21 September 2007. ^ Anita Singh. "Cannes Film Festival: Jude Law's peace campaign". The Daily Telegraph. 19 May 2008. Retrieved 20 May 2008. ^ Mark Brown. "From Afghanistan to Cannes: how Jude Law joined film-maker's campaign for a world day of peace". The Guardian. 20 May 2008. Retrieved 20 May 2008. ^ Simon Crerar. "Jude Law calls for more happy news from Afghanistan". Times Online. 20 May 2008. Retrieved 25 May 2008. ^ "Peace One Day Gala". Peace One Day. Official home page. Retrieved 1 August 2008. ^ Roshan Khadivi. "Actor Jude Law and director Jeremy Gilley in Afghanistan to promote peace". UNICEF. Official home page. 3 September 2008. Retrieved 7 September 2008. ^ "UNICEF Special Reports". UNICEF. Official home page, video linked. Retrieved 7 September 2008. ^ "Karzai meets British actor Jude Law". AFP. 4 September 2008. Retrieved 7 September 2008. ^ "Jude Law says: give peace a chance". The Sunday Times. 14 September 2008. Retrieved 25 September 2008. ^ Charlie Rose. "A Conversation with Actor Jude Law". The Charlie Rose Show. 19 October 2007, broadcast on WNET (New York), 22 October (to 23 October), 2007, 11:30 pm – 12:27 pm (ET); video clip posted 27 October 2007. Retrieved 12 November 2007. ^ "Natasha Law". Eleven Fine Art Gallery, London. ^ Dolly Jones. "Fashion Law". Vogue. 10 May 2006. Retrieved 19 November 2007. ^ "Jude Law, Sadie Frost Divorce Official". People.com. 29 October 2003. Retrieved 25 January 2010. ^ "Jude Law Biography". People.com. Retrieved 25 January 2010. ^ Stephen M. Silverman (5 January 2005). "Jude Law to Marry Girlfriend Sienna Miller". People. Retrieved 18 July 2008. ^ "I cheated on Sienna: Jude". Sydney Morning Herald. 8 July 2005. Retrieved 2008-07-18. ^ Pete Norman (12 November 2006). "Jude Law and Sienna Miller Call It Quits". People. Retrieved 18 July 2008. ^ Law becomes dad for fourth time . BBC News. 24 September 2009. Retrieved 26 September 2009. ^ "Hey, Jude, It's a Girl!" People. 23 September 2009. Retrieved 26 September 2009. ^ "Jude Law & Sienna Miller Take Romantic Ride in NYC". uk.eonline.com. 18 December 2009. Retrieved 10 May 2010. ^ "Sienna Miller, Jude Law & Kids Holiday Together". uk.eonline.com. 28 December 2009. Retrieved 10 May 2010. ^ "Fifth Child on the Way for Jude Law". People. 16 October 2014. Retrieved 16 October 2014. ^ a b c d e f "Where are They Now?". National Youth Music Theatre. Retrieved 2013-01-02. ^ a b c d e f "Past Productions". National Youth Music Theatre. Retrieved 2013-01-02. ^ "Hampstead Theatre: A History in Pictures". Hampstead Theatre. Retrieved 2013-01-02. ^ "Live Like Pigs". The Royal Court Theatre. Retrieved 2013-01-02. ^ "Les Parents Terribles"Archive Performance Database and Archive Catalogue: . National Theatre. Retrieved 2013-01-02. ^ "Indiscretions". Internet Broadway Database. The Broadway League. Retrieved 2013-01-02. ^ "Artistic Director, David Lan". Young Vic. Retrieved 2013-01-02. ^ "Beckett at Reading 2006 : Gala Evening". Beckett International Foundation. The University of Reading. Retrieved 2013-01-02. ^ "Jude Law to star in Samuel Beckett Centenary Gala Evening". BBC. 23 March 2006. Retrieved 2013-01-02. ^ "Hamlet". Michael Grandage's official website. Retrieved 2013-01-02. ^ "Hamlet". Internet Broadway Database. The Broadway League. Retrieved 2013-01-02. ^ "Anna Christie". Donmar Warehouse. Retrieved 2013-01-02. ^ "Henry V". Delfont Mackintosh Theatres. Retrieved 2013-01-02. ^ "Henry V". Michael Grandage Company. Retrieved 2013-01-02.